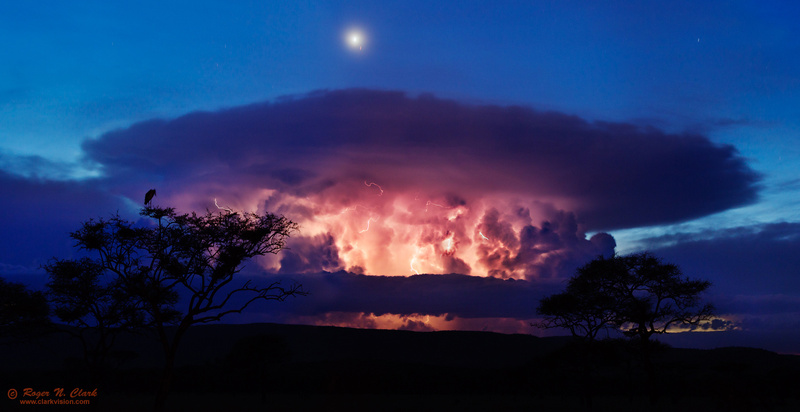 Camping in the Serengeti, Tanzania, Africa, one night a spectacular thunderstorm developed an hour after sunset. A stork in the tree watched the developing storm as multiple lightning bolts flashed every few seconds in the expanding mushroom cloud. The bright object above the cloud is the planet Venus, and several other stars are visible. Technical. Canon 6D 20-megapixel digital camera, Canon EF 70-200mm f/4L IS USM Lens at 70 mm, f/5.6, ISO 400. This image is a mosaic of 4 consecutive 30-second exposures. I would have used my 24-105 f/4 L IS lens but it had been damaged on the trip and the image stabilization would not turn off. The storm was too large to fit in the frame with a 70 mm lens, so a quick mosaic was completed, which resulted in a higher resolution image with more detail.